One of my favorite songs is by the band, The Clash and it’s called, “Should I stay or Should I Go”. It’s not just because it has a great beat. I like the song because it applies to my line of work, and if you listen closely, it can apply to many issues related to your professional world. As a career coach, I frequently see clients who are unhappy with their job and want to leave. They complain about disliking or disagreeing with the management, schedule, coworkers, location and just not feeling fulfilled. Many of their reasons may be valid. Management may not always seem fair to you, but (as I’ve said in other blogs), we are not always privy to the larger issues and management goals. Perhaps, the frustration lies elsewhere. If you think you will be deciding to stay in your job, here’s something to consider. Last year I purchased a Groupon for dance lessons with dreams of learning to swing dance. I put off registering until it was almost too late and then the evening came to join the group. I finally showed up, a bit nervous and was absolutely surprised at how much I enjoyed the mental and physical challenge of learning a new skill. Lesson learned: challenge yourself both on the job and in your life. Ask the manager if you can take on new challenges. It will help to engage you more in the job and they will appreciate your initiative! Maybe, if you found some things that you love to do—both at work and as an avocation, you would enjoy your work day a bit more. Are you interested in creative pursuits (painting, acting or music) that you could do in your free time? Would you like to participate in local community theater? If you think you might be leaving your current position, something else to be aware of is that it’s important to be strategic on timing. Don’t leave a job because you are frustrated or because of an emotional reaction. Make sure you plan it out. I know of a client who left a job less than a year after the employer paid for his high level certification. He didn’t read the fine print and he had to pay back several thousand dollars to the employer because he left 3 weeks short of the anniversary date. Timing and strategy also apply if you are thinking about retiring. Make sure that you are prepared financially. If you leave too early, it may be almost insurmountable to return to the professional level you were once working. Plan ahead, get excited and look forward to the next phase in your life. Few people can afford to leave a job without a replacement. Keep in mind that even if you can afford to do it, it may be difficult to explain to the next employer because it may look as if you were fired. At JCS Career Center, we can help you to work through these issues, help you tell your “story” to the next employer and improve your chances of getting hired. There’s a lot to think about. 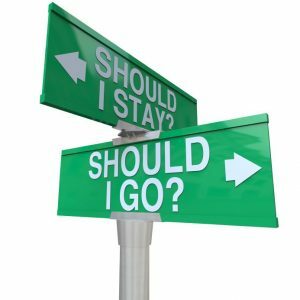 Recognize that leaving a job can be an agonizing decision because as the song says ‘If I go there could be trouble, if I stay it could be double.” So whatever you decide to do, just make sure you’re considering all the consequences.